I am a firm believer that two individually awesome things can sometimes combine forces to become one outrageously awesome duo. For instance: lemon and raspberry. Samoas cookies and ice cream. Root-beer and ice cream. Bubblegum and, well, anything. Chocolate and peanut butter. Chocolate chip cookies and brownies. Buffalo sauce and shrimp. Shrimp and beignets. Almond Joys and brownies. I mean, I could go on. But I think you understand that this awesome duo is especially applicable to desserts. Or at least, since that’s only what’s ever on my mind at any given time, that’s what I think. And everyone knows what I think is totally right. And if it isn’t, well, this is my blog and I say so. So there. You know I love snickerdoodles. That’s why I have made snickerdoodle cupcakes and my sugar cookie snickerdoodle cookies and blogged about them so the world could know. Snickerdoodles could do no wrong. In fact, if it were humanly possible (now, when I say ‘humanly possible’ does that even apply to this situation given that I am talking about a cookie which, in fact, is not a human being? But at least you know what I’m saying, right? Okay.) that a snickerdoodle murdered someone, I’d probably just keep the snickerdoodle in hiding from the police but make it feel really bad about its wrongdoings and then con it into letting me eat it. I know I’m weird. You guys can stop making those weird, awkward facial expressions now. I know you’re doing it. So stop it. You look weird. There? Did you stop now? That’s right. Anyways, when I discovered that Kate over at Grin and Bake It made my dreams come true and found yet another way to make snickerdoodles even more awesome, I was all over it. Seriously, they can do NO. WRONG. So I made some. And you should too, in case snickerdoodles start committing crimes in your neighborhood and you need to know how to hoard them for your own benefits. 1. Preheat oven to 350 degrees F. Lightly spray-grease a 9×13 inch baking pan. Set aside. In a mixer bowl fitted with a paddle attachment, beat butter on high speed until creamy. Beat in sugars until blended. Add in eggs and vanilla, until combined. In another large bowl, stir together the flour, baking powder and salt; gradually add flour mixture to the butter mixture, blending in after each addition of flour until a soft dough forms. 2. Spoon half of the batter into the prepared baking pan and spread into an even layer. Sprinkle with the cinnamon sugar filling mixture. Drop with heaping spoonfuls of remaining batter. If gaps show, that’s okay. Lastly, bake approximately 20-25 minutes or until golden brown and a toothpick inserted in the center comes out clean. Let cool completely, about 1 hour. 3. To make glaze, blend all ingredients together in a small bowl. 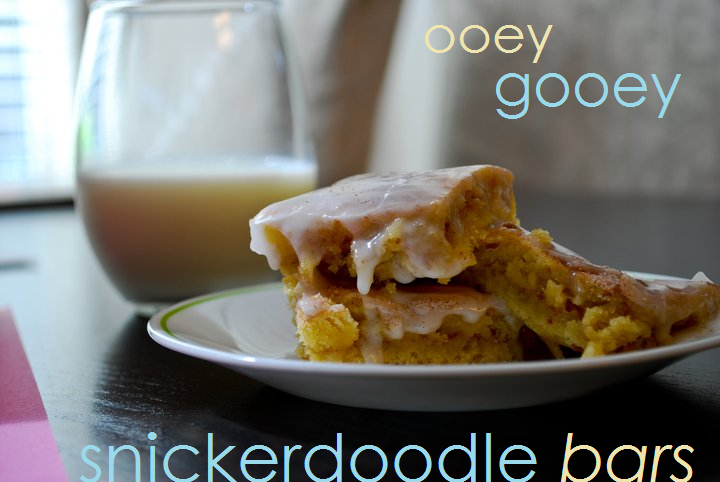 Drizzle over cooled snickerdoodle bars, and cut into squares. Obviously, this is best served warm, highly glazed, and with a glass of milk. The only way to do it. Kind of like wine and cheese are the perfect pairing? Snickerdoodles and milk need to be together. It’s a must. And tearing them apart — who’s the criminal now? Make these. Or I’ll find you and judge you and make you think I’m weirder than you did before. Promise.